Ashintully's terrain lends itself well to the presentation of challenging birds for the more experienced teams and we place a strong emphasis on the social aspects of a shoot day. 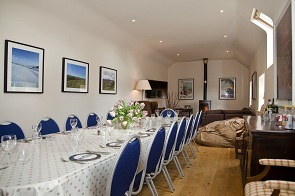 All guns are encouraged to ride together in the estate vehicle and with lunch taken in the Long Room complete with wood burner and sofas for the ultimate in relaxation. A limited number of mixed pheasant & partridge driven days will be available for the 2013–2014 season, as well as some smaller semi-driven days which have proved popular for smaller parties of up to 6 guns. Click here to contact us regarding shooting availability.